An English teacher from the United States talks about the place in Moscow that reminds him of home. “I'm originally from Seattle but, in recent years, have lived in different exotic places — South Korea, Japan and now Russia. “I don't miss the U.S. that much anymore. But when I am feeling down, I know places that make me feel better — for example, Kolomenskoye. It is a nice big park where a person can have some privacy. In my home town of Seattle, we have Madison Park, which is somewhat similar to Kolomenskoye — a wide-open space where you can sit by yourself. 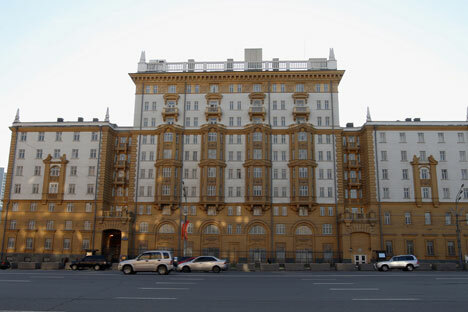 “Of course, the most American place in Moscow for me is the American Embassy. Recently, I had to get my passport renewed, and so I went there. I saw public drinking fountains at the embassy, which I really miss living here in Russia. True, the embassy only has them in the section for American citizens. It's such a small thing, but how cool it was to see them. “While in Moscow, I sometimes miss the U.S. sodas — not Pepsi or Coke, but the independent brands. But I have been able to find something similar here. I sometimes miss Mexican food, which is very easy to find in the States — not only in the South, but everywhere. Even Seattle is full of Mexican restaurants. “In Moscow, there are restaurants with Mexican cuisine, but it isn't really authentic. Casa Agave actually isn't a bad spot. But still something's not quite right with both the food and the atmosphere. Moscow also lacks cafés with good burritos and fast food. I don't mean McDonalds. I don’t go there, or to Burger King. Fast food can be different. “I love Moscow architecture. I wouldn't say that it is similar to American, but maybe in some way. Not far from Tverskoi, I saw the Anglican Church of St. Andrew. In the U.S., there are a lot of these types of churches. And there's also the big Catholic cathedral on Malaya Gruzinskaya that is not a typical Russian church. Here, Western churches are not very common and, every time I see them, I think of the States. They've got a Western feel. “In Kropotkin, there are new apartment buildings that are built in the same style as the yuppie suburbs of Seattle. It is very strange architecture for Russia, atypical. To be honest, I don't like buildings like that myself. But they look American. “One of the most Western places in Moscow is the Vinzavod [winery], which I really like. Probably all Westerners would feel at home there, because it's got a sense of freedom.